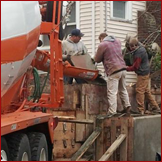 Shoreline Concrete in Shoreline, Washington is your top source for foundation repair and other concrete services. Trust in Shoreline Concrete for foundation repair and other concrete services. We specialize in foundation stabilization through pin pile driving to stop your foundation from sinking into the ground. Our team uses two-inch sized galvanized pipe that can be driven as far as 30 feet down, if required. The expert team with Shoreline Concrete will also replace foundations in cases of failure or collapse by raising the house. Older houses may have limited head room in the basement, or may be located in a flood plain. In these situations, it may be beneficial to raise the home from one to three feet and give the basement more space. Never settle on second best. We offer professional removal and replacement of all types of concrete, including driveways, sidewalks, stairs, retaining walls, and foundations. Contact us in Shoreline, Washington, for foundation repair and driveway installation.